Sussex Cricket has announced their Academy intake for the 2017 season. The Academy is a combined programme between the ECB and Sussex Cricket, and all seven of the players who have been selected have retained their places from last year’s intake. Joe Billings, Tom Gordon, Tom Haines, Nick Oxley, Nick Smith, Ben Twine and Harrison Ward are the make-up of the 2017 intake, under the tutelage of new Academy Director Carl Hopkinson, who has taken over the role from now Director of Cricket Keith Greenfield. Joe Billings is a 17 year-old wicketkeeper-batsman from Haywards Heath who made his debut in Sussex’s Second Eleven last season. In 2015 he hit a record score for the Under-16’s, hitting 210 against Surrey and sharing a 193-run partnership with Tom Gordon. Batsman Gordon was part of the Sussex Under-15’s side that triumphed by winning the ECB County Cup in 2016 and has also played for Sussex’s Development XI in the Sussex Premier League. Tom Haines made his Specsavers County Championship debut for Sussex against Kent at The 1st Central County Ground back in August and the 18 year-old opening batsman won the Academy Player of the Year Award for the second year running. 17 year-old Nick Oxley made his Second Eleven bow in 2016 and the batsman, who also bowls left-arm Chinaman, plays for Worthing in the Sussex Premier League. He made 150 in the Under-17’s match with Essex at Hove last season. Nick Smith and Ben Twine are both primarily right-arm seam bowlers. 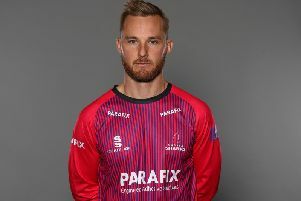 Smith, who hails from Chichester, made his debut in the Second Eleven in September, and Twine, from Eastbourne, has been playing for Sussex’s Development XI in the Premier League. Harrison Ward is part of the Academy thanks to Sussex’s link-up with Oxfordshire. The 17 year-old batsman has combined playing for the Minor Counties side with Sussex’s Second Eleven. He is the youngest player to have scored a century for Oxfordshire in Minor Counties cricket. Sussex’s Academy Director Carl Hopkinson said, “We have seen many young players progressing from the Academy in recent seasons to the first team and our aim is for that to continue. “We’re excited by the group we have together and are very much looking forward to the programme progressing. “Our tour to Cape Town begins on 3rd December and the group are all working hard now towards this trip. It will be another opportunity to display and work on skills in a different environment.